This is set to be the first in a series of Edit-Select parties hosted by digital funkmaster Percy X. His new label continues his devotion to stripped back electronica with minimal sounds of Detroit influence - currently doing serious damage to the record bags of Villalobos, Hawtin and Luciano. 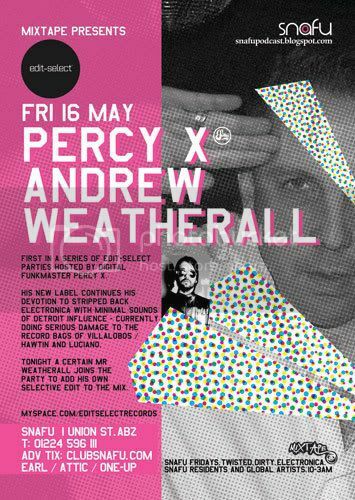 Tonight a certain Mr Weatherall joins the party to add his own selective edit to the mix, much to the delight of many a techno connoisseur we imagine.